Below are some of the most frequently asked questions patients have about root canal therapy. If you have any other questions, or would like to schedule an appointment, we would love to hear from you. Q: What is an Endodontist and what do they do? Endodontists are dentists who have received additional training to provide the highest level of care for the soft inner tissue of teeth called the dental pulp. The narrow channels inside the roots are known as "root canals". Within the root canal, there is a unique and soft tissue known as the dental pulp. The dental pulp contains tiny nerves that are commonly responsible for toothache pain. Occasionally, the tissue can become injured and bacteria can contaminate the root canal spaces. The result is a painful infection that will not resolve until this tissue is removed. Root canal treatment is directed at the inside spaces of the tooth and is designed to eliminate infection, remove diseased tissue, and prevent re-contamination. A common misconception is that the roots of the tooth are removed during root canal treatment. This is not true; your tooth will remain intact and healthy after treatment. It is only the inside spaces that are treated and sealed. The Illustration below shows the stages of treatment, including completion with a permanent crown once root canal therapy is complete. Q: What happens during endodontic treatment? Priority number 1 is to always ensure your comfort during treatment. A small amount of local anesthetic will be given to gently numb the area around the tooth. The tooth is isolated with a latex sheet called the "rubber dam" (non-latex rubber dams are also available for those with a latex allergy). The rubber dam is placed around the tooth to keep all the dental materials from getting into your mouth, as well as isolating the tooth from saliva (which contains bacteria). Once you are completely numb and the tooth is isolated, the diseased pulp is gently removed from the tooth, and the spaces are cleaned and disinfected with various irrigating solutions. Once the tooth is cleaned and dried, the canals are sealed and a temporary filling is placed in the small hole in the tooth. Q: Will my root canal be completed in 1 visit? Extreme calcification or curvature of the canals. These are just a few of the reasons your tooth may require a 2nd visit. The doctor places a special medicated paste inside the tooth to further disinfect the inside of the tooth. If your doctor says you need to come back for a 2nd visit, it will not cost any extra. The procedure is billed out that day to your insurance and your copay is collected, but it does not cost you more out of pocket to come back. Our primary goal is to give you the best prognosis for your tooth in a comfortable and relaxing setting. Sometimes, this is impossible to achieve in 1 visit. Q: Why does my tooth still hurt when I chew? I thought once you had a root canal, the nerve is gone. This is a complex question. Not only do teeth have a pulp on the inside of the tooth, but each tooth also has a small ligament (called the periodontal ligament) that is on the outside of the tooth. This ligament has an abundance of nerve endings, and can become inflamed or sore due to the inflammation in the pulp of the tooth. In time, this pain usually subsides with rest and anti-inflammatory medications such as ibuprofen (talk with your doctor before starting any over the counter pain medication). Some patients have a history of clenching or grinding their teeth, which will most certainly cause an increase in pain to biting or chewing. 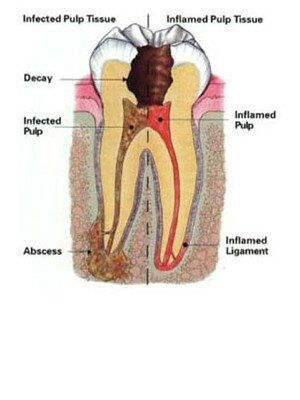 The diagram below illustrates the difference between an infected pulp with abscess formation and an inflamed pulp with ligament inflammation.